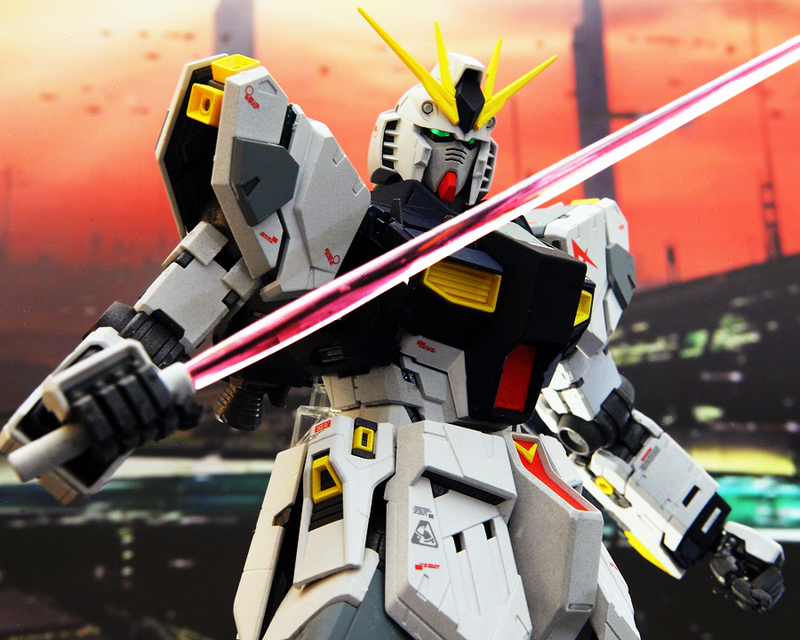 MG Nu Gundam Ver. Ka with funnels deployed. 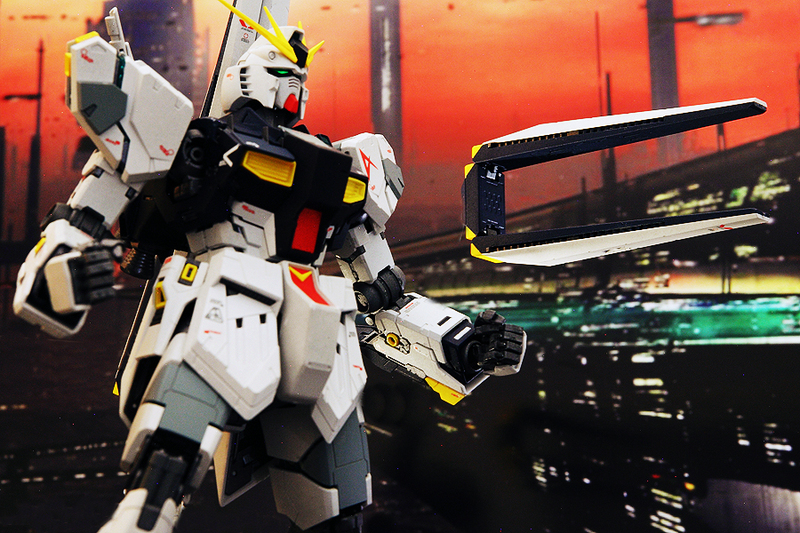 I first learned about the MG Nu Gundam Ver. Ka last year, and I was amazed at the design with more details than its previous incarnations. I wasn’t really a fan of the previous version, but was just amazed at the details and changes made to this master grade model. In addition to its normal form, you can change various pieces of the model so that certain parts (green pscho-frame bits) are exposed to give the model a pscyho frame look. 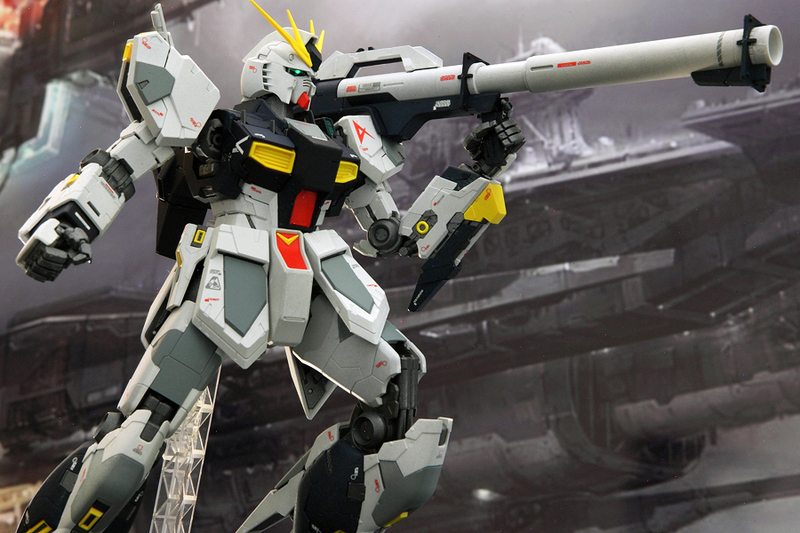 It doesn’t look really different when you change i compared to the MG Gundam Unicorn. 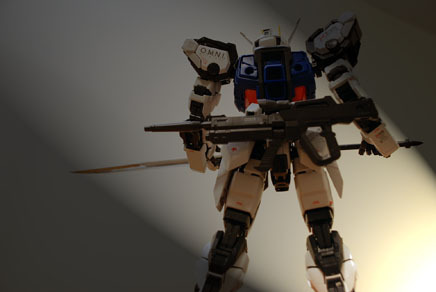 The model is very poseable as expected from a master grade and the weapons and shield fit perfectly into the hands thanks to a new connection system where pegs are not only found in the hands but in the accessories as well to give a very, very tight grip between the hand and weapons. 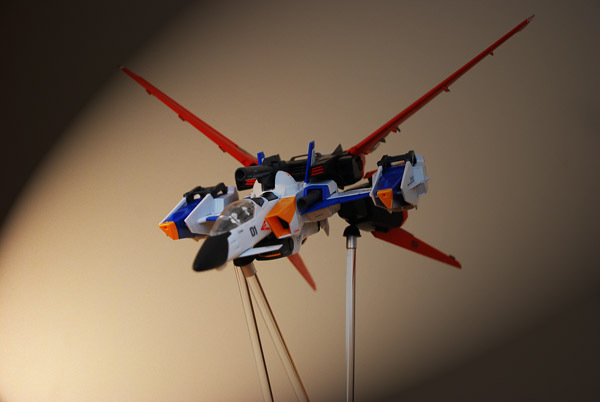 The Nu Gundam also comes with funnels that can be attached in the back, as pictured above. 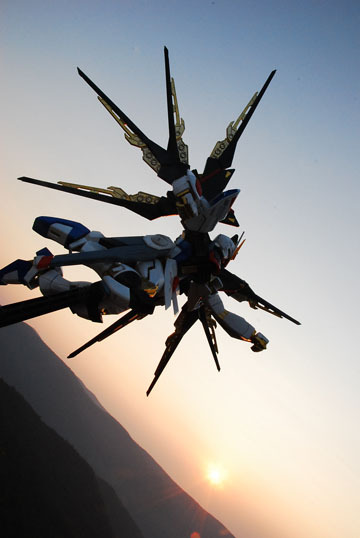 The funnels are used as separate attack units as seen in the movie Char’s Counterattack. 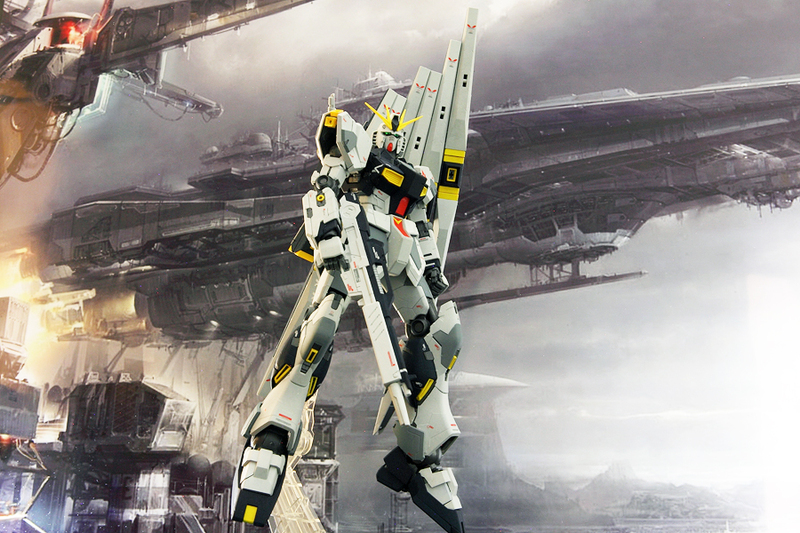 The good news is that the funnels look very impressive, especially when you attach each separate one to the stand. Unfortunately, when you combine the funnels and place them on the model’s back, they tend to very flimsy as they are all connected using small pegs to attach to one another. I’ve noticed that when I place the Gundam on the stand and move it at an angle, all the funnels tend to bend towards the model. It’s not a very secure system, and at times the funnels have fallen from the model when I try to move it. As I said before, the stand which holds the model and funnels is more than adequate to show this model off as it provides for a variety of poses while utilizing the funnel system. 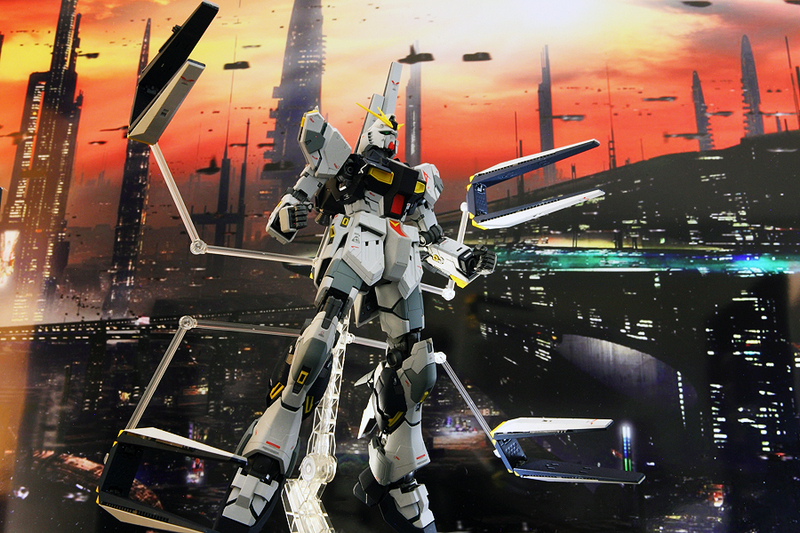 Nu Gundam with funnels deployed using the very effective stand. It’s been about three years since I put together and painted a Gundam model. The last one I posted was the Sazabi and that took months. It was refreshing to paint the model and put it together in less than 2 weeks. 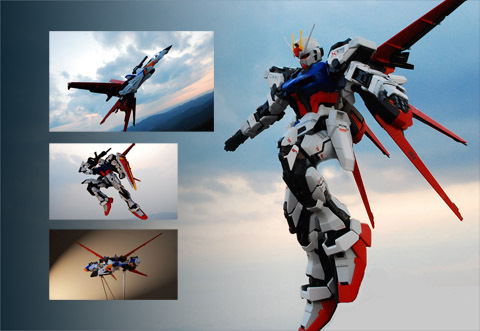 I think what originally put me off building Gundam models before was how much time (and MONEY!) was involved. 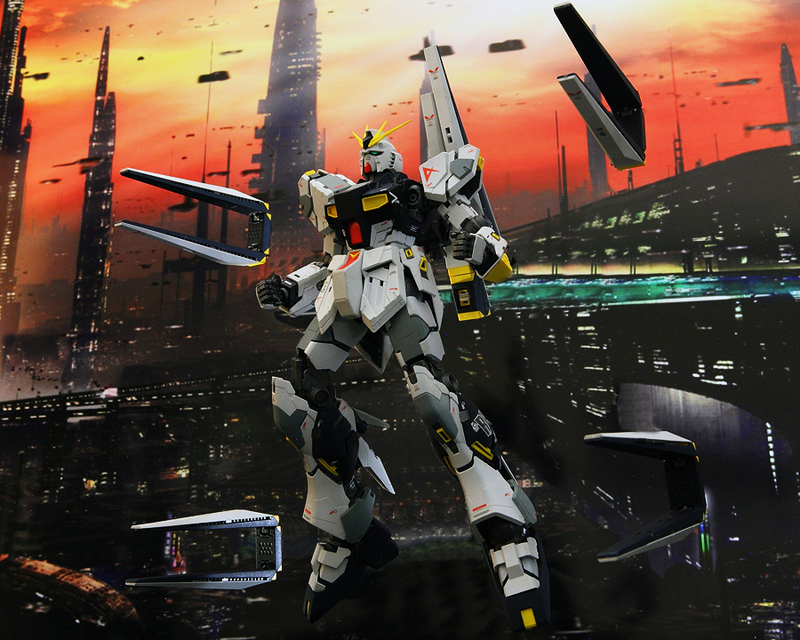 My next project will be the 1/144 Qubeley by Model Comprehend and I will use the same workflow as I used with the MG Nu Gundam. 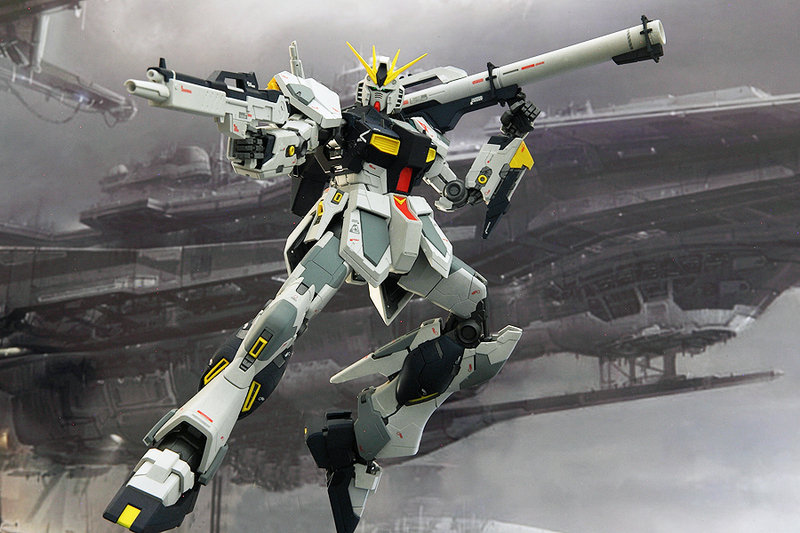 Overall, I think people who didn’t like the Nu Gundam model before, will be quite impressed with this model. There was enough changes for me to take a second look and make a purchase. Sinanju aerial strike using beam shield. I figured when I left this blog over a year ago that I wouldn’t return. 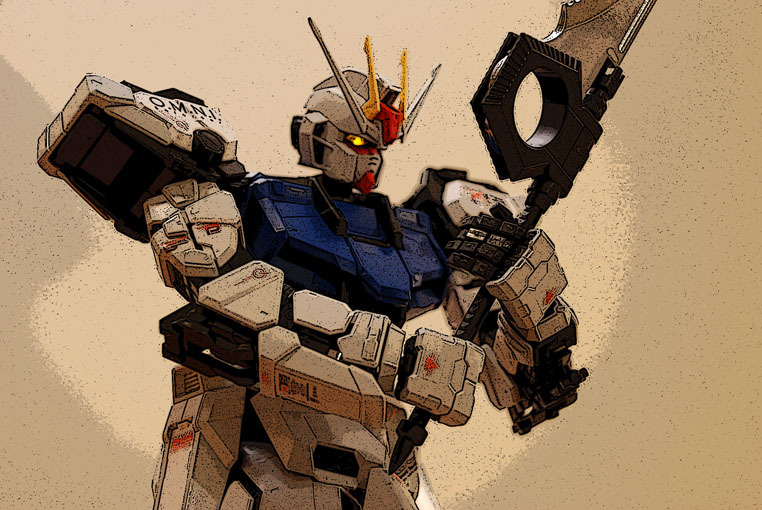 But alas my love for Gundam and Anime has returned. I plan to continue this blog on a regular basis. At least an update every month. 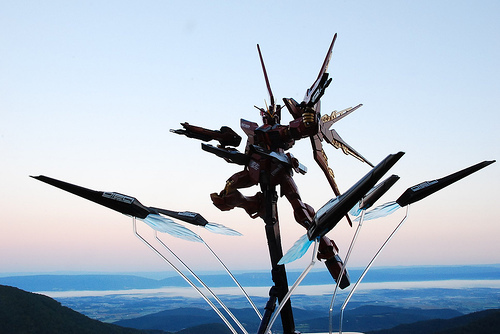 I start off with the Mobile Suit that brought me back, the MG Sinanju. I really didn’t expect Bandai to churn this one out. 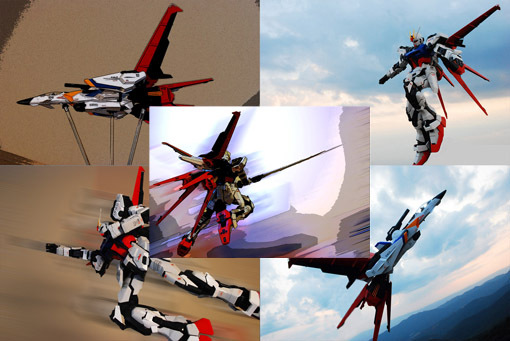 I figured the company would just direct all attention to Gundam Seed and its predecessors. But I’m glad they decided to produce the mecha. 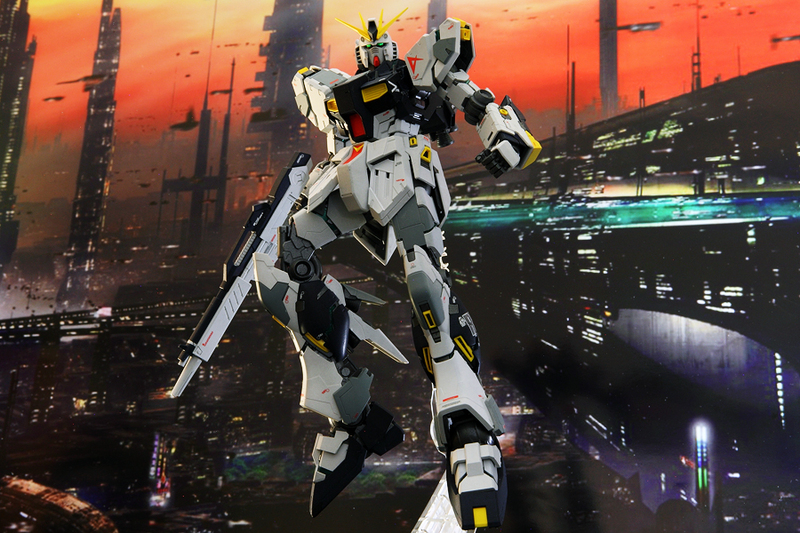 I also review the MG Unicorn which I had bought last year and played around with the idea of doing a post on it, but never got to it. My usual shooting studio, the Blue Ridge Mountains, is no longer available to me so I decided to play around with indoor settings, light and shadows and some digital manipulation. 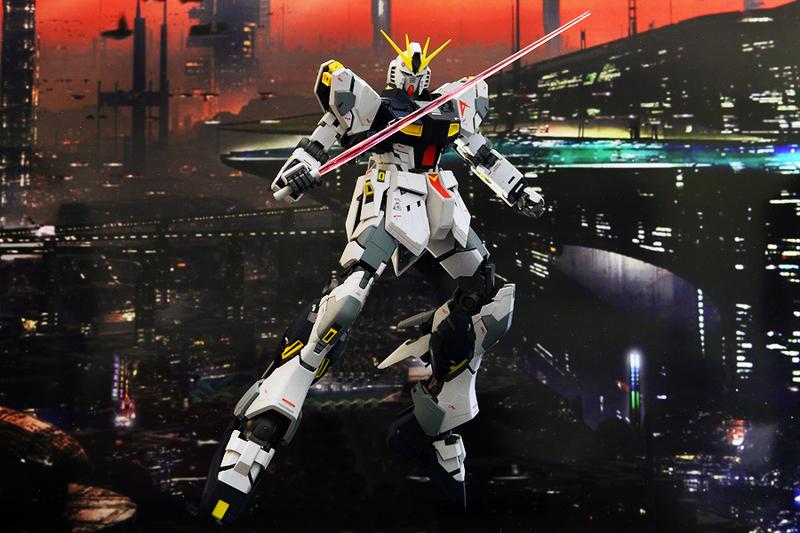 Posted in Gundam Model Reviews. MG Strike Enforcer over Shenandoah Valley. I like this picture because of the valley and the fog below that was giving off a bluish kind of tint that really added to the pic. Later on the fog crept up on the mountain rather quickly as you’ll see later. I’ve seen a lot of modded Gundams online, including recently here and here, and didn’t really think about modding a Gundam since I’m fairly new to Gunpla. Earlier last month a new friend sent me an MG Strike Gundam as a thank you gift. Rather than return it, which would be very costly considering where it came from(and rude) I kept it and decided to color custom mod it. The Aile Striker and Skygrasper. Outside pics have stand removed. 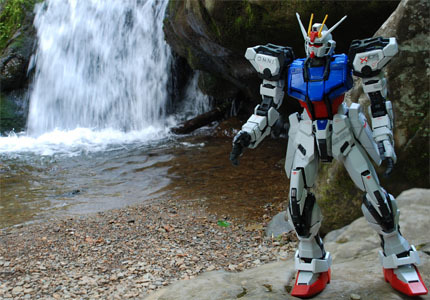 The first time I took a Gundam with me mountain hiking it was the RX 79(G). Which was pretty easy to take considering how tiny it was. I was lucky enough to get a good shot with it. This time around I brought the Aile Striker and Skygrasper with me and I wanted to try capturing both in flight. With the 79G there was no problem since it’s basically a ground unit. With The Striker and Skygrasper it was tougher to get in place for a shot that featured a good background that showed flight. But I did manage to get some shots of both in flight and snap a few test shots that I want to save later for a Gundam model project.